You must make reservations at least 5 minutes in advance of the time at Jammyland. Street parking is free all day and unlimited in the evenings. The free downtown loop stops just north of Charleston. Jammyland Cocktail Bar & Reggae Kitchen invites every guest on a psychedelic journey through the multicultural roots of Jamaican cuisine. To complement Chef Grayer’s fare, Jammyland’s bar mixes the freshest and craftiest cocktails in town (or just about anywhere). The Reggae Kitchen is always open late, and closed Mondays & Tuesdays for the summer. The heart of the LV Arts District boasts ample parking and bike share stations. What a fun place to eat! Food delicious, especially the chick pea sliders , plantains and ugali stcks! Music a bit loud outside but love the fire pits. Such a fun part of Vegas! Date night with the wife drinks were great...chicken wings were dry and over smoked. The food and service were excellent. We went on a Thursday and the inside was packed, regardless by the end of the evening we new all the staff by name. The wings and ribs were smoking and delicious, they even impressed the two competitive BBQr's in our group. It was wonderful. It's my new favorite spot. Just an friendly triple date. Didn’t expect the added gratuity at the end, but it’s ok. The food was absolutely phenomenal. Low and slow ribs, sliders, jerk wings and plantain fries. Will definitely be coming back. Can’t say enough about the food. Came here for girl's night and the music was great. Loud enough to enjoy but not so loud we couldn't have a conversation. Our server was friendly and helpful with the menu, but not over the top, which I like. The cocktails were well made and not too sugary. Everything we tried we liked. The polenta fries, wings, chickpea sliders were my favorite. Definitely recommend for a fun night out with friends. Phenomenal. The food was amazing and the service was above and beyond. Will definitely go back. This place is awesome! Definitely my favorite restaurant and bar in Las Vegas! We had a great time sitting at the bar during a quiet Friday night. We chatted with the bartender and once she realized we really appreciated well-made drinks she offered some excellent recommendations. The food is mainly small plates but it was very good with nice spice levels on the jerk chicken and the ribs. The excellent sound system was pumping a great variety of modern reggae tunes. It was cold outside when we visited but there is a huge outside patio that is open to the bar when it is nice weather. I would like to visit again in summer to check that out. The restaurant was kind of slow for Saturday night. But the food and service were excellent. Great atmosphere, space, food. We enjoyed our whole experience and the outside seating was the icing on the cake. The food is Jamaican and the drinks are outstanding, you can sit outside and it was beautiful. Great service even though we were sitting outside. Had an amazing time. Nothing I ate disappointed me at all. The jerk wings were 👌. Cocktail menu interesting. Nice vibe. Definitely will return! I went to Jammyland to satisfy my jerk chicken carving. I went straight for the 24 -Hour Jerk Chicken. Ths menu description was very enticing...but what I actually got was super dry smoked chicken with ZERO traditional Caribbean herbs and spices (eg., allspice, thyme). This dish shouldn't be referred to as jerk...smoked and salted yes, but not jerked. I requested the optional pineapple dipping sauce hoping it would salvage the meal...sadly, it didn't. Remove "jerk" from the description and customers will have the appropriate expectation and will not be disappointed as I was. Service was fast and attentive...Jamaican food was excellent. Fun atmosphere. Good music...cute neighborhood place in the Arts District. As a Las Vegas local, I really appreciate places that make me feel like a local, while also being welcoming to our tourist population. The level of attention to detail here means that people remember my drink preferences, while also showing off the best of our town to brand new people. As soon as the weather is cool enough for the patio to be in normal use, that will be our go-to hang out. Great Food! Great Service! Great Vibe! 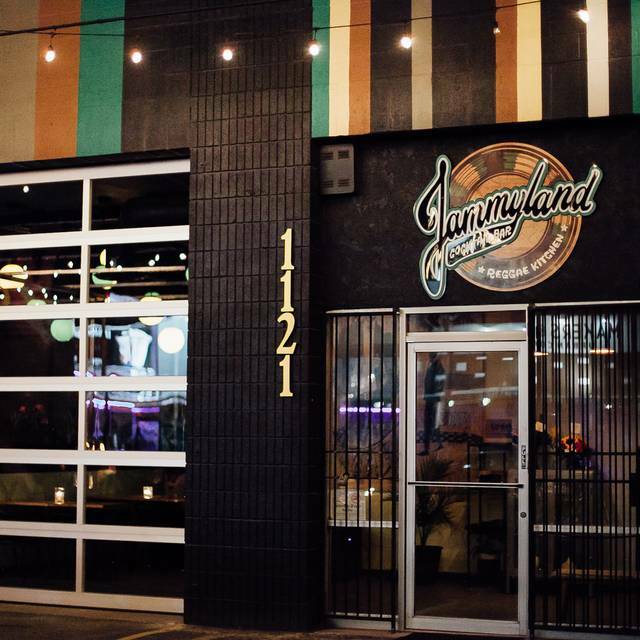 Jammyland is one of our favorite new places in downtown. The food has been consistently great, but the cocktails are the real stand out. They're exemplary. The patio area is also really nice (after sundown). We can't wait to see the dessert from Restaurant Week on the regular menu!